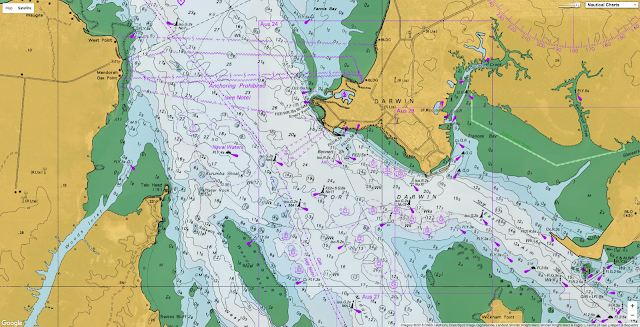 A video 'fly-through' of Geoscience Australia mapping of Darwin Harbour (no audio). On first glance, Darwin Harbour appears much like any other Australian port, but a new geographic survey has documented ancient geography and ghostly shipwrecks in unprecedented detail. 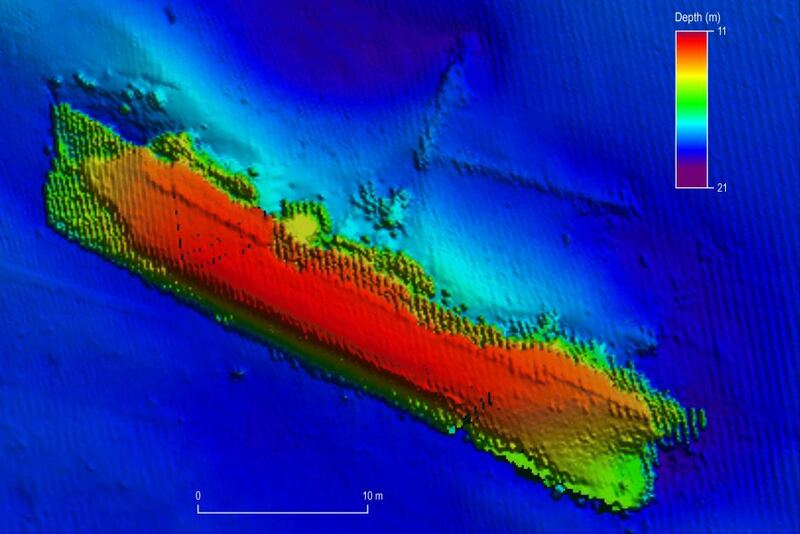 Navy and merchant shipping sunk by Japanese air raids in 1942, as well as the wreck of a ship lost during Cyclone Tracy in 1974, have been captured in the new marine survey of Darwin Harbour by Geoscience Australia, the first results of which have been publicly released. Beginning in May this year, the research ship Solander operated 24 hours a day over a month mapping Darwin's northern beaches and northern coastline of Cox Peninsula, using "multi-beam echo-sounder technology". 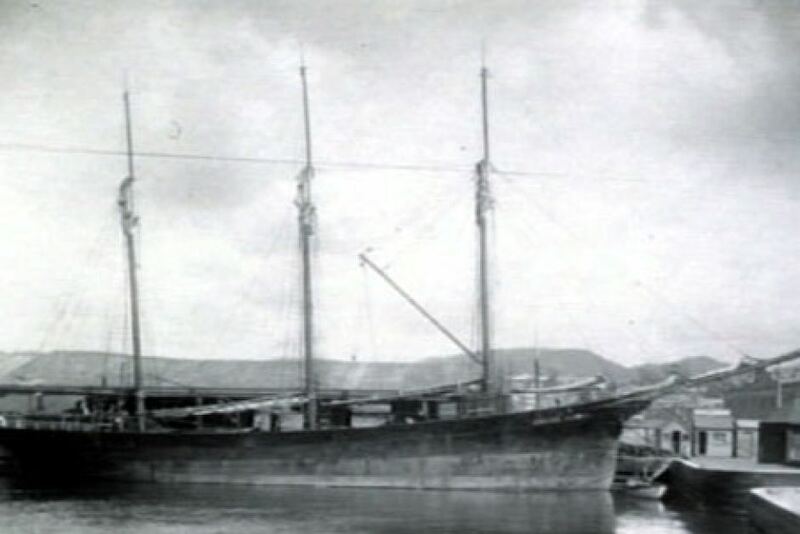 The Booya, which sunk in high seas caused by Cyclone Tracy in 1974. Geoscience Australia said the collaborative four-year project, with the Australian Institute of Marine Science and the NT Government, brought together "over 50 years of experience in sea-floor mapping and has enhanced efforts for better estuary and coastal management in the area". 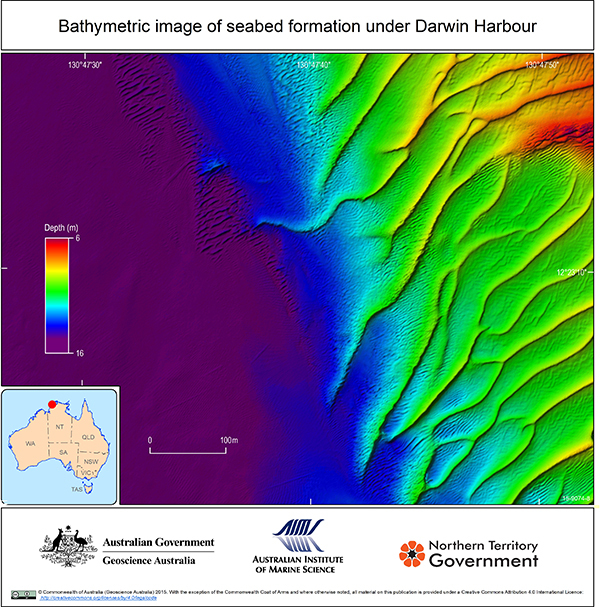 The results of the survey, which Geoscience said revealed "relicts of Australia's ancient geography in the form of sub-marine sand dunes, ripples and sand waves", also generated new bathymetric imagery of the Booya, a ship which took shelter in the harbour as Cyclone Tracy approached but was sunk, with five lives lost. Also mapped was the World War II American transport ship USAT Meigs, which was torpedoed and bombed during the Japanese surprise attacks of February 1942.
with the different depths indicated by colour changes. 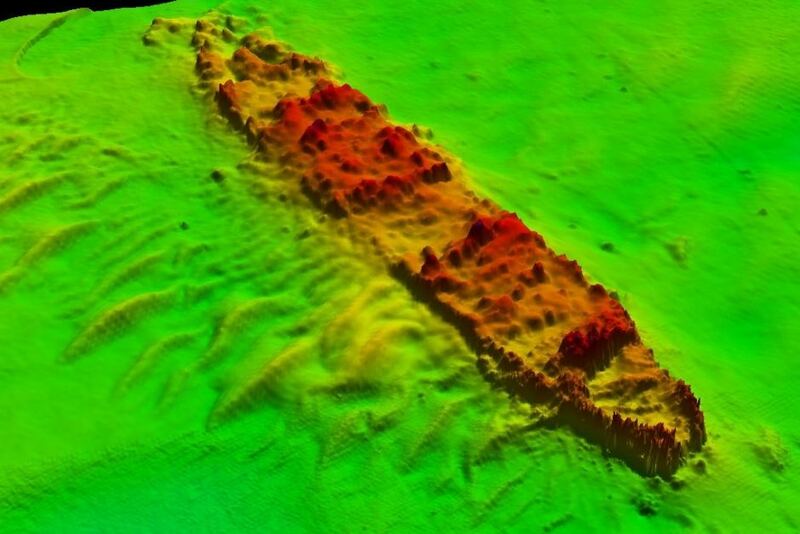 "These images are a great contribution to our continuous efforts to better understand our marine archaeology, and to manage these historic shipwrecks in Darwin Harbour," said David Steinberg, senior heritage officer with the NT Government. Geoscience said the mapping helped understand the area's geography as far back as "the last ice age, some 20,000 years ago", to a time when a land bridge existed between northern Australian and New Guinea. "This crucial research significantly enhances our efforts for better estuary and coastal management of this area, while creating the best-mapped tropical macro-tidal system in the world," Neil Smit, a scientist on the project, said. "It's also an exciting test case for scientists who hope to better understand complex environmental systems like Darwin Harbour." The project was funded by Inpex, operators of the Ichthys LNG project. 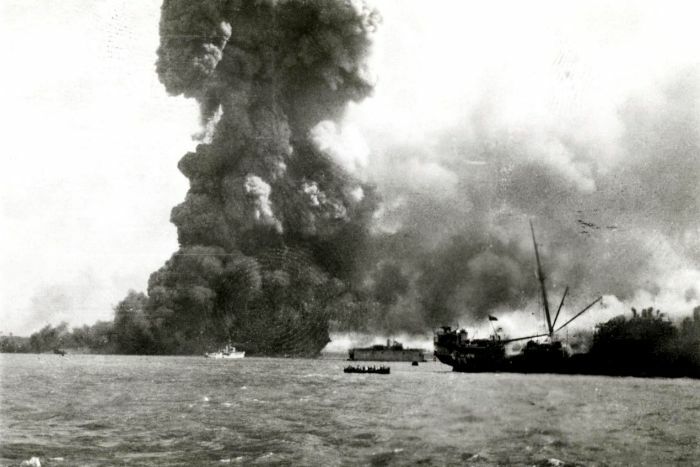 The SS Neptuna explodes after being hit by enemy fire in Darwin Harbour, February 1942. Recreational divers, if they are not put off by the low visibility of Darwin's murky waters, reptilian predators or perilous jellyfish, are asked to take a "look but don't touch" approach to the many heritage-listed ship and aircraft wrecks scattered on the harbour floor. Official records list 25 vessels, including fishing trawlers, ferries, yachts and naval craft, as wrecked or missing after Cyclone Tracy in 1974, with 16 people dying at sea. The Booya, a 35-metre three-masted schooner, was anchored on Christmas Eve when Tracy hit Darwin. The wreck was discovered in 2003 at a depth of about 20 metres - with authorities in recent times pleading for respect to be shown to the exclusion zone around the site, as the Booya deck "displays the efforts of the crew to save the ship". In February 1942, the US Navy destroyer USS Peary, US transport ships Meigs and Mauna Loa, Royal Navy tanker British Motorist, cargo ship Neptuna and other shipping were caught by surprise in Darwin Harbour when over 200 Japanese planes attacked in two raids. The Neptuna, laden with a cargo of depth-charges and explosives, was hit and caught fire, with many killed as they prepared to abandon ship by an explosion. which lies on the floor of Darwin Harbour after being sunk by the Japanese in 1942. The Peary was reportedly hit by at least five Japanese bombs as it attempted to make for the open sea, with a hit on its ammunition store the final blow. The Mauna Loa is reported to have sunk after being hit by two bombs that went through an open cargo hatch. Now sitting in about 18 metres of water, the twisted deck of the Mauna Loa is littered with ammunition, motorcycles and gun carriers. Official records list the death toll of the two raids numbering "at least 243 people", with between 300 and 400 wounded. Over 60 subsequent attacks on Darwin would take place during the conflict. In a final irony, the salvage rights to the scrap metal of many shipwrecks were sold to a Japanese company in 1959. 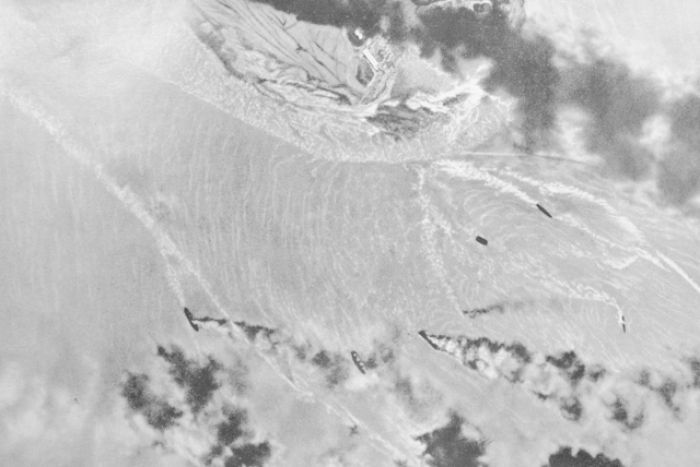 A Japanese reconnaissance photograph of Allied ships burning in Darwin Harbour after the attack on 19 February 1942.